I have to say I really like how A/C 20''s feel. I want them on all my mechs now! 5 ammo seems kind of low though, should I put another thing of ammo on mech with the a/c 20 or do I want to use it sparingly ? What I do is add more and then see what you end a mission with after a couple missions you can gauge how much you use. I'd say two tons minimum for AC/20 ammo in the campaign. 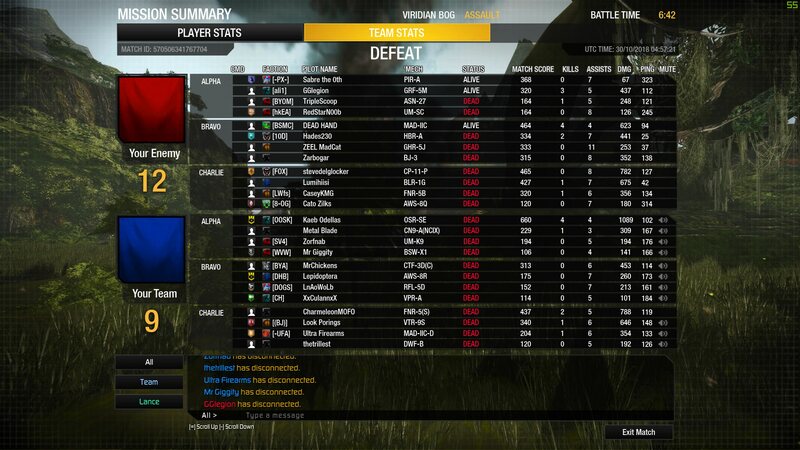 10-15 turns is what you should aim at on a Battletech mission. Closer to 15 if it's a story mission (although more like 6-10 turns of fire if it's a very shortranged weapon). Anyone got advice on armor spreads? I feel like I'm probably going light. Also, looking over my mechs, most of them have a PPC. I'm guessing not all of them should have PPC's lol! I think my 2 best mechs are one with an A/C5 and 4 M lasers, although it runs hot, and my guy with an A/C20, 2 M lasers, and a set of SRM. He can run hot though too. I put jump jets on all my mechs as well, I probably don't need to do this. 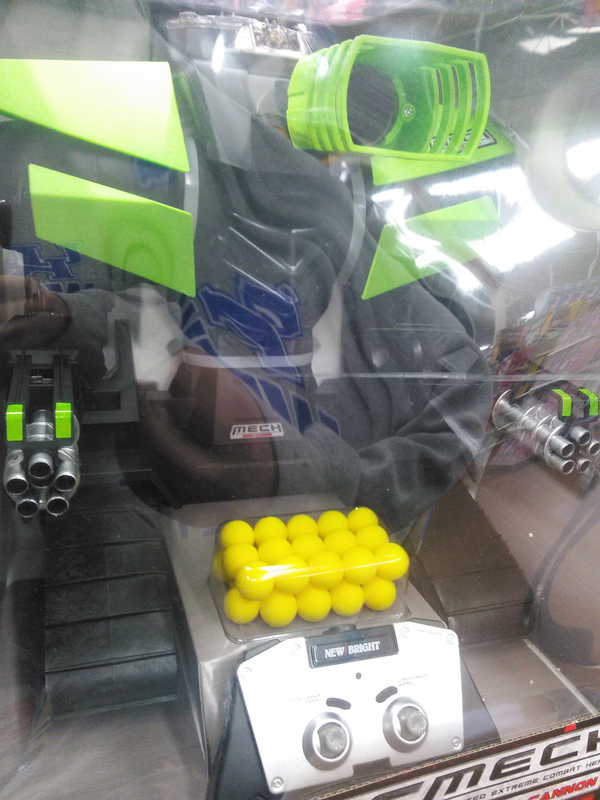 Oh yeah this thing can fire it's machine guns forever. The only downside is that I move like a light but everyone can shoot at me easily. Fleas are almost too small for my torso weapons to hit them as well. Might go back to a LBX or something. Max all armor, especially if you are running a melee mech with lots of small laser / machine guns. Half armor, if you are running a long range sniper / lrm mech. I recommend removing all ppcs, they pay a heavy tonnage tax for range you will very rarely be able to use. Large laser is 30% lighter and more efficient. To go for maximum efficiency, max out armor, then srms, medium lasers, and then remaining tonnage for the biggest ballistic you can fit. 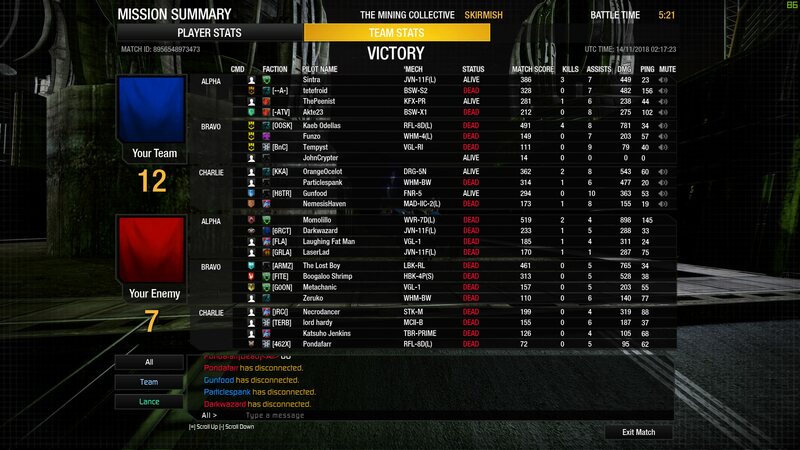 I agree mostly that you should not have so many ppcs but they do have a place for damage plus sensor scramble. Large lasers are just pure damage. Mlas and ballastic are the most consistent damage dealers though so I would do 3/4 of the Lance that way and then a ranged sniper with some lrms and a ppc. 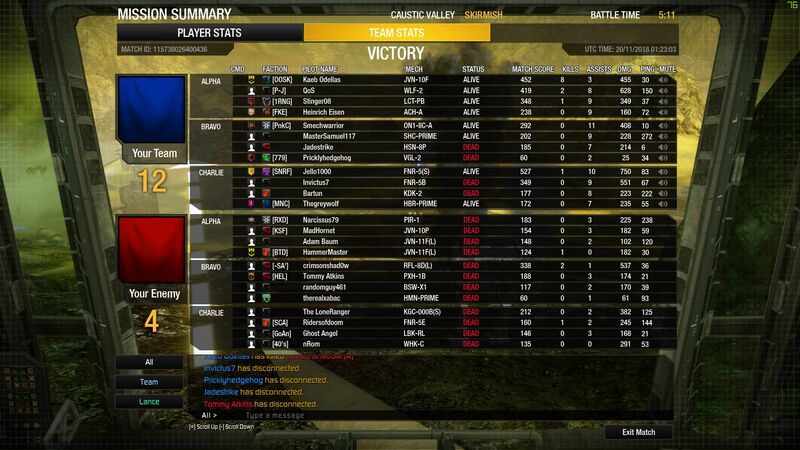 *edit* I also have onetha'ts really low armor and a LRM20 ++ LRM 15 ++ LRM 5. and 3 things of LRM ammo. You're generally too low on armor. That shadowhawk should have 80+ armor on its legs and arms, 100/120/100 RT/CT/LT frontal armor and 25+ rear torso armor. And NEVER skimp on head armor. 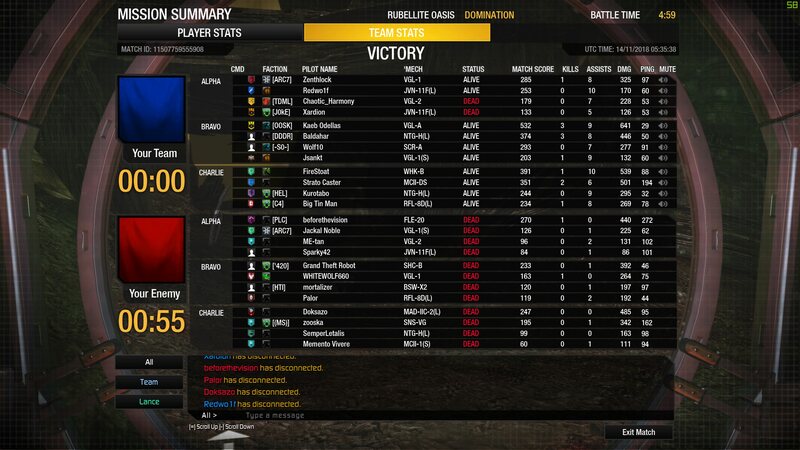 I'm pretty sure that one I actually didn't lower the armor at all from the default, just swapped out the LRM's. Think I should be close to having enough levels and proper mechs under my belt for the next story mission. The blackjack is now one of my lower tonnage mechs. Have 1.5 million stored up and in a place with 2 1 skull missions for another 500k. Think I should be able to tweak my mechs, do a few more missions, and get ready for the next story mission now. 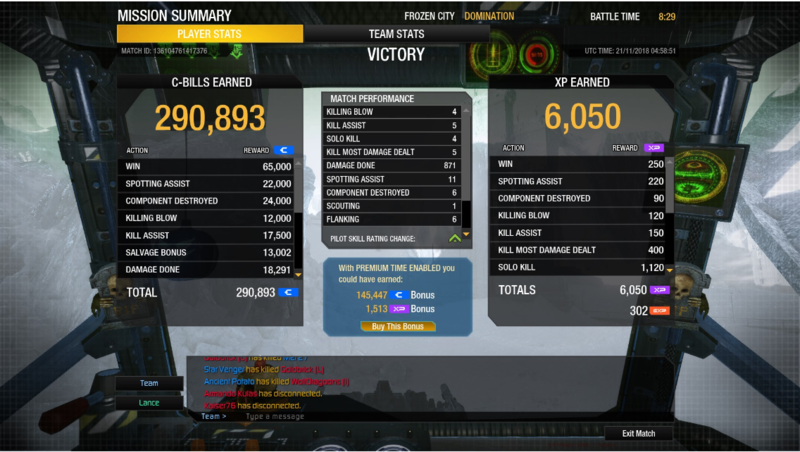 @Fiendishrabbit does my mech with the A/C 20 have enough armor ? Sidetorso and leg armor is armor is a little weak. I would dump 1-2 JJs and put that weight into primarily the right sidetorso (if you lose that you lose the arm as well, so 35 back armor and 100+ front armor), up the leg armor to 65 at least (preferably 80) and reinforce the CT just a smidegon (120-130 is good for a centurion). If you have weight left, reinforce the LT as well, but the Right torso is your greatest weakness right now. One lucky hit there and you lose almost all your firepower. Also, transfer the AC20 ammo to the RT and the missile ammo to the LT. The way it's layed out now you lose ALL your firepower except your lasers if you lose the RT. Upped all of that. Also upped dome armor on other mechs, lack of jump jets makes me sad though. Also completed that story mission. This time I just happened to have a mech in range of the spawning mechs so they nevery attacked a turret. Made the mission way easier as I had more. Now they offer me unlimited medium mech parts. Bought one and gonna do the 2 missions here before moving on again. I'm close to broke again lol! Maybe it was a mostake had 2.5 mill bought 3 mech frames, down to 800k with 2 or 3 missions on this planet. In vanilla Battletech, usually ballistics are incompatible with good jumpjet capability. They're too heavy. Equally lasers are not that great since heat is at a premium (but medium lasers are so space/weight inexpensive that you should probably mount them anyway, even if you stop shooting them once heat becomes a premium). As such the best jumpjet mechs have a lot of support and/or missile slots and then pack in a good number of heatsinks as well. As such a Shadowhawk 2D with MGs, SRM6 and MLs (don't put guns in the head once you get cockpit items) and the Grasshopper (with 6 MGs and a bunch of MLs) are two of the best jumpjet mechs you've got. The Highlander can be quite a good jumpjetter as well as all Highlanders have advantages that at least allow you to use jumpjets without feeling the pain too much. 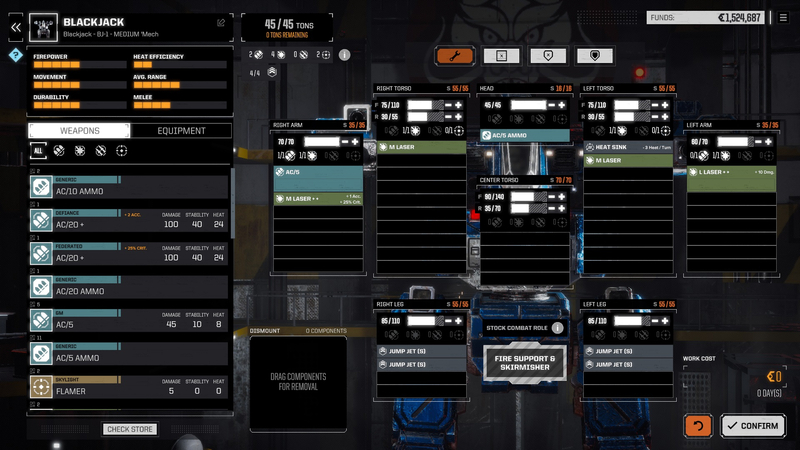 In campaign BATTLETECH you should be maxing front armor (unless you have a dedicated LRM boat you can keep out of fire). 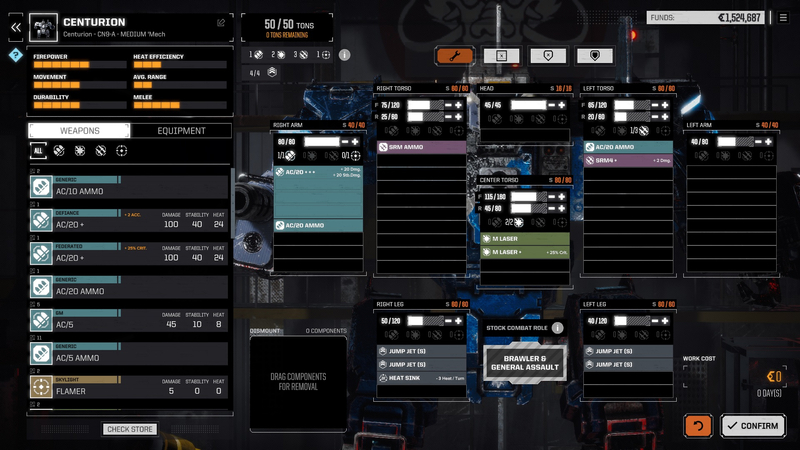 If you get a 75+ tonner early while still doing 2-3 skulls, you can get away with 70-80% front armor for that mech until the mission difficulty keeps up. If you don't max front armor, you will get more armor blowthroughs, spend more time in machbay, and have more unpaid idle time when you aren't in or on your way to a C-Bill generating encounter. If you don't max front armor, you will get more armor blowthroughs, spend more time in machbay, and have more unpaid idle time when you aren't on or on you way to a C-Bill generating encounter. I'd disagree with this. Not that more armor isn't good, but most mechs are going to lack firepower or utility if you try to always put max armor on them. After all, not being able to take out mechs fast enough due to lack of firepower from less guns or poor heat sinking will create more repairs too. In my opinion, most mechs will fare just fine if you can get 75% or above on the armor bars (rear armor excepted). Though you can cheat lower on the legs, say 60%, due to the AI on average hitting them less. For example, RickRude's ShadowHawk is underarmored (I would have dropped the two SRM2's if adding those 2 extra medium lasers and kept the stock levels of armor), whereas the Blackjack looks just fine and he could even steal 20 points from each leg to reinforce other areas. Now if you're getting below 50% (the stock Jagermech is a good example), that mech should be kept as backline firesupport. edit: On the Centurion, I'd flat out drop the SRM4 for more armor and move the AC20 ammo the the right torso so the entire left side is dead and can be used as a shield. Put me in the more armor camp though. If you specialize your mechs and concentrate your fire max armor shouldn't reduce your ability to remove targets. 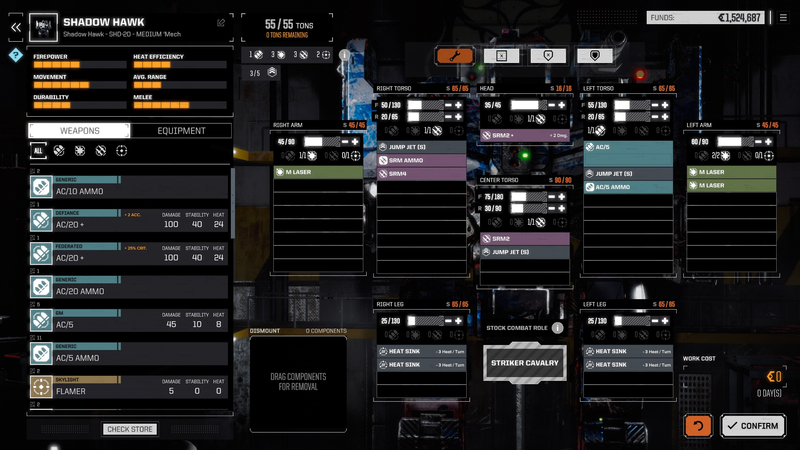 Maxing armor is the easiest way to be cost effective in Battletech. It prevents you from taking any damage that requires expensive repairs. You don't lose weapons to crits, and you don't have to repair structure. An SRM2 or 4 is almost inconsequential once you start getting matched up against two or three time the mechs you have on the field. However, those 2-3 tons of armor could save you a trip to the mechlab afterward, allowing you to drop a second mission immediately for twice the loot in way less time. But armor doesn't making things explode! I guess realistically the srm''s aren't doing much. 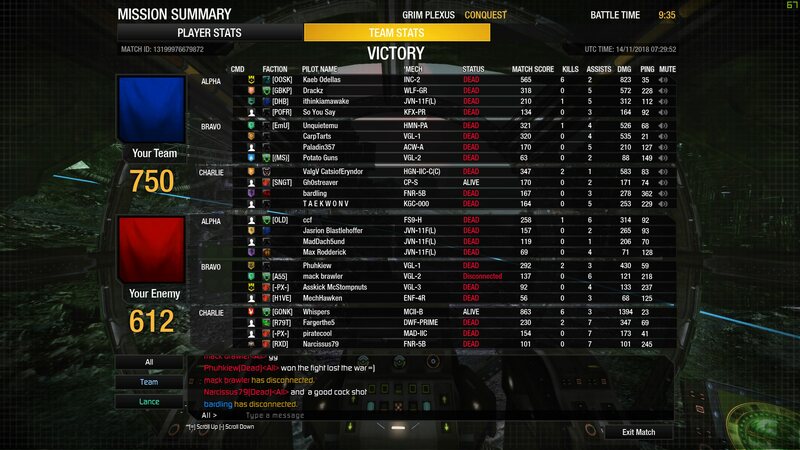 They used to be lrm''s so they were even worse! Heh. Ok, next time I boot it up I'm going to look at my armor. I do get a lot of armor breaches. I also need to look up what everything on the screen means. I get the just of it but I feel like I'm missing something with the armor and body bars. Thanks for the tips guys. Very addicting game kind of reminds me of mercanaries MW2. I keep wanting to do just one more mission before stopping. I always max armour first on a naked mech and then build it out to do the damage I want with the role I want the mech to play. I. E. A sniper build or a laser build or zoom zoom missiles. 3. Add cool electronics and / or melee. 30% bonus MC and 50% off of Heroes and Mech Bays right now. So 30% bonus MC, possible freebie with purchase, and 50% off the stuff you want for MC. If you've been holding off on dropping some cash, this is a fairly good time to grab what you want. You can get a bonus Hero Light for 15 bucks, or a bonus Medium for 30.  Grinner, maybe? I don't have it myself, but the WLF-2 is a blast and I assume Grinner is even stronger. I dropped $15 to get the Sekhmet+MC. Between that MC purchase and what I've won from streamers, I've got 8500MC kicking around. Probably gonna pick up a Cipher and I might get the Spirit Bear. Picked up some more Mech Bays just in case. Grinner is a good Light. 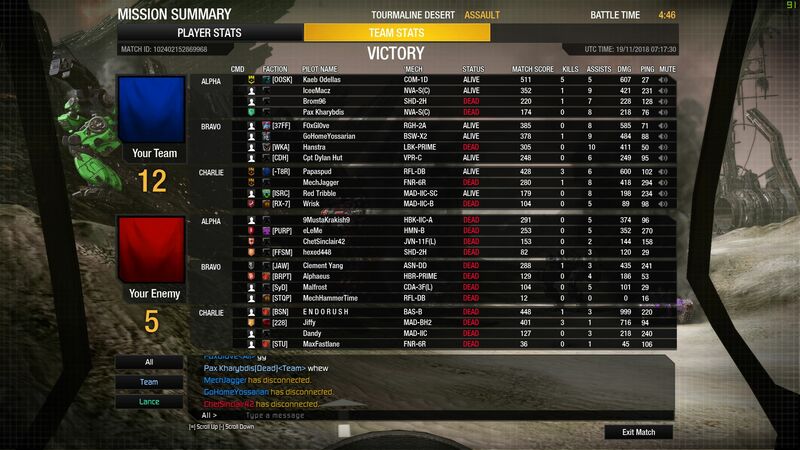 Tanky as hell with ECM. I've got mine running stealth armor with 4 MPLs+ERSL. Hmm I might. Ive been having a hard time bring effective in my Wolfhound as is. I'm a little confused about these specials. If I spend $15, I get 3900 MC and a Pirahna "Cipher" Hero Mech, is that right? I would avoid the Oxide. With the resize it is easy to kill now. Long ago it was a good mech along with the Raven Hero. Edit: If you like missiles on mechs and want a light. Go with the Jenner IIc for 6SRM4s. It is my go to mech when I need to give out some explosions. You'd get the Osiris Sekhmet with matching Mech Bay at this point. But yeah. MC plus a Hero Mech. I'm not great in my Wolfhound, but I enjoy it and ECM would be the cherry on top. I've been thinking about giving MWO another shot after playing so much battle tech. No I want to shoot someone with an ac/20 in first person. So we're in the second week? I figure we're a few hours till then right? Whenever Nov 20th 12:00 PM UTC is. Went with the hero Mauler, Huntsman, and Wolfhound plus like 4 drop ships of hangars. Now at 16 mech bays, and fully caught up with the daily countdown events. Took my BSW-1X back out for a spin for the scouting one. Man, after playing a few other mechs for a bit I'm really appreciating this one more. 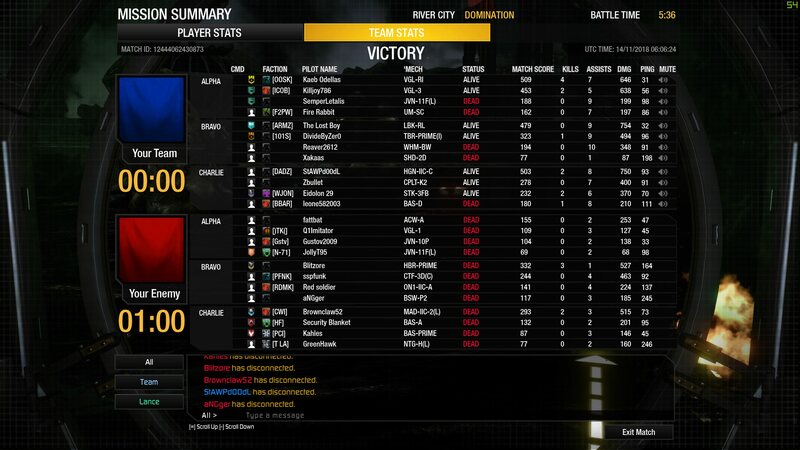 Dual UAC/10s are just nasty and and it's tanky as all hell.